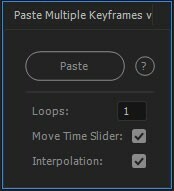 Smart copy and paste keyframes from multiple layers at the same time. Upgrade notice: If you purchased v1 within the last year you will receive a discount equal to 100% of what you paid for it, if you bought it more than a year ago the discount will be equal to 50% of what you paid. Simply login with the same account that was used for the original purchase. Please contact support if you have any questions. (ie. Layer 1 has keyframes at 0 seconds and 5 seconds.